Daily Illuminator: Munchkin Marvel 2 In Stores Now! October 14, 2016: Munchkin Marvel 2 In Stores Now! Sweet Christmas! 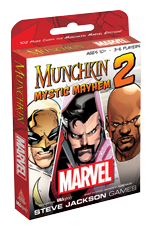 Munchkin Marvel 2: Mystic Mayhem is now at your friendly local game store, packed with demon hunters and magical weapons. The expansion to USAopoly's acclaimed Munchkin: Marvel Edition, Munchkin Marvel 2 adds fan-favorite heroes from The Defenders like Doctor Strange, Luke Cage, and Iron Fist, along with their iconic accoutrement like the Eye of Agamotto. They square off with the worst that earth, and the underworld, has to offer. Powerful magic users like Baron Mordo, assassins of The Hand, and even the demons Dormammu and Mephisto all aim to defeat you, and they'll use every trick in the book to do it. New oversized Dungeon cards allow you to fight in classic Marvel locations, like the Sanctum Sanctorum, Savage Land, and Helicarrier. Each location has its own rules, sometimes benefiting the heroes and other times giving the Monsters a buff. Not to mention two more Infinity Gems are in this pack. If you have the Infinity Gauntlet promo card from USAopoly, then this gets you one step closer to completing the ultimate weapon! With all these new additions, Munchkin Marvel 2 brings a dark twist to the base game. Visit your local game store to pick up a copy today. Just try to avoid opening a gate to The Dark Dimension, please.